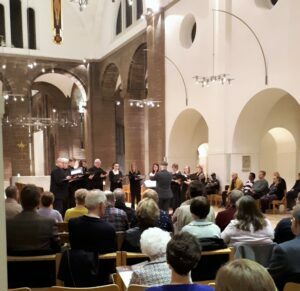 On Saturday 30 March the Community opened its doors for an evening of music provided by one of the finest vocal ensembles in Yorkshire. The Tallis Consort is a semi-professional ensemble of 10 singers who specialize in the performance of Renaissance Polyphony. Directed by Chris Why they performed Tomás Luis de Victoria – Tenebrae Responsories (1585) and the Requiem Mass (1603). Many joined us for what proved to be a highly enjoyable, relaxing evening. We would like to thank Chris and the ensemble, we hope an opportunity arises in the future for them to perform in the church again.